Always by appointment. Read the terms. As of January 1, 2015 opening adjustment; no drop off and pick up on Sundays and holidays. What exactly is Jellastone Pet Park? Jellastone Pet Park is a holiday adress for cats, smaller dogs and probably other kind of pets. During your holiday or days not being around, your animals can find a temporary home at Jellastone Pet Park. Jellastone petpark has four different sections. A section with 4 spacious kennels (5X2 meter) for dogs with a playing area from 400 square meters. 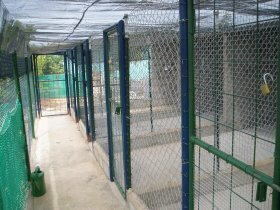 One section with 2 kennels (4X2 meter) with a playing area from 200 square meters. This section is suited for dogs that can jump high or climb easily. 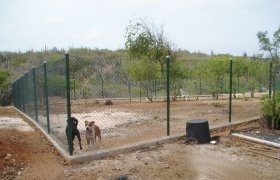 Kennels are covered with wire and the fence in the playing area is 2,4 meters high. One section especially for small dogs (up to 10 kg) with 4 small kennels and a playing area from 250 square meters. Furthermore, there are six kennels that are each in their own space. Jellastone Pet Park also has nine spacious (6 by 8 ft and 7 ft in hight) kennels with climbing facilities for cats. 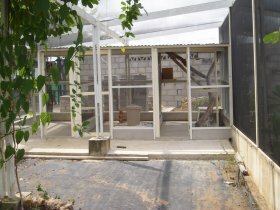 These kennels are suited in a greenhouse from 500 sq ft where the cats can play freely during the day. The greenhouse is completely covered so the cats can't escape. The owner from Jellastone Pet Park is Jella van Berkum. I love animals myself a lot (I've several dogs and cats of my own) and for me it was always very hard to find someone who would take care of the animals if I wanted to leave the Island for holidays. I also preferred someone who would be around a lot and who would spent the night at home because I didn't want my pets being alone during the night. It also had to be someone who understood my animals. 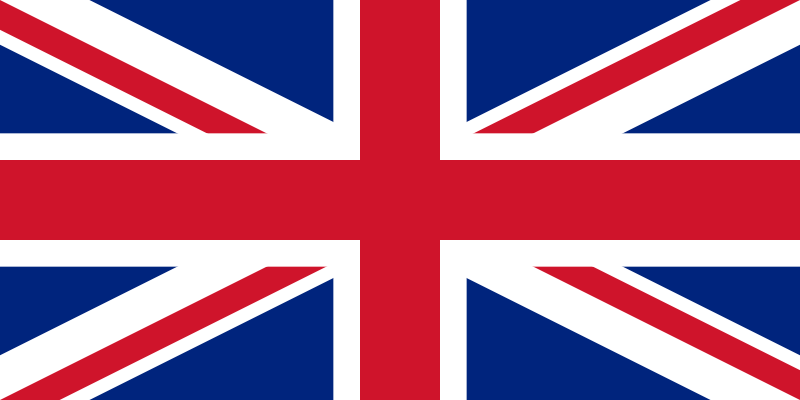 To find such a person on the island was almost impossible. So I simply didn't leave the island anymore. I realised I probably wasn't the only person with this problem. In 2004 I worked as volunteer during the sterilisation project at the animal shelter. There I experienced that the animals ,which mostly were very nervous, did trust me a lot and felt safe with me. There the idea popped up to start taking care of other peoples pets. Today also Jan, my partner, lives here and in his free time he does chores around the house and the kennels. Taking care of the animals is mainly my task. And sometimes he makes the gate open for you. Why should you bring your pet to Jellastone Pet Park? The animals will be let out regularly and the get lots off personal attention. The animals will never be alone during the night. Twice a day the animals will be fed and water will be refreshed regularly. Because I have extensive experience with animals I almost immediately notice when an animal is sick or doesn't feel well and I will immediately take appropriate measures. Also frightened animals feel quite at home. If you want more information or like to see the facilities, call me and make an appointment. I welcome you and your pets at Jellastone Pet Park.